Central Asian states are eyeing with concern the planned expansion of the Shanghai Cooperation Organization to include India and Pakistan, regional analysts say. With the addition of the two South Asian countries, the membership of the organization -- now China, Russia, Kazakhstan, Kyrgyzstan, Tajikistan, and Uzbekistan -- would increase from six to eight. Four of those are outside Central Asia, and all four of those are nuclear powers with populations and economies that far surpass those of the SCO's four Central Asian members. 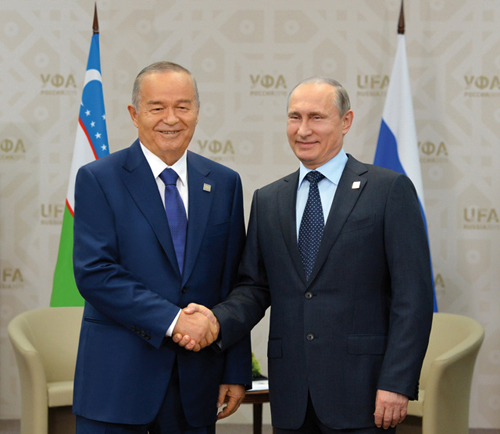 While there is little room in the SCO for public dissent, Uzbekistan President Islam Karimov issued probably the most surprising statement of the summit, saying that the addition of India and Pakistan "would not only change the political map, but would change the balance of power. This is not a simple issue, and it needs to be discussed." That went against the conventional wisdom in Ufa, which was that the addition of India and Pakistan would make the SCO stronger and was to be welcomed. On India and Pakistan, Karimov "said what everyone was thinking, but wouldn't say," said Galiya Ibragimova, a consultant on Central Asia at the Moscow PIR Center on Political Research, in an interview with The Bug Pit. The concerns about the addition of India and Pakistan are various. In Karimov's case, he is worried that it would shift the group's attention away from Central Asia to South Asia. Ibragimova pointed out that Karimov has traditionally not wanted to participate in groups where the focus was outside of Central Asia, noting that its decision to pull out of the Collective Security Treaty Organization in 2012 was justified by the fact that the CSTO was also getting involved in conflicts outside the region, for example Nagorno Karabakh. "This doesn't mean that Uzbekistan will suspend its participation in the SCO, especially as Chinese infrastructure projects on the mainland part of Eurasia are discussed in the organization," she said. "But the former importance of the organization for Tashkent may begin to decline and the country will again intensify the bilateral diplomacy with its partners for which it's known." That concern is shared in Kazakhstan, as well. "Closer cooperation with BRICS and SCO countries is in our [Kazakhstan's] interest. At the same time, it's important to avoid involvement in geopolitical vortices that can carry us away from our real interests," said Askar Nursha, a foreign policy scholar at the Astana Institute of World Economy and Politics, in an interview with Kazakhstan newspaper Kursiv. And one official think tank scholar in Astana suggested that the planned expansion could be blocked. "De jure, the process has yet to be fully clarified. It is quite possible that an existing SCO member could block their entry," said Sanat Kushkumbayev, deputy director of the Kazakhstan Institute for Strategic Studies under the President of the Republic of Kazakhstan, an an interview with the website Russia Direct. "Karimov noted with good reason that the entry of nuclear India and Pakistan to the SCO could change the balance of power inside the organization and internationally. There are many unresolved issues between Delhi and Islamabad, and how this will square with the SCO’s declared spirit of cooperation is unclear." In addition, not all of the members of the SCO are happy with its role as a platform for criticizing the West. "Kazakhs want to avoid SCO turning into anti-Western bloc. There is also understanding that the so-called 'Shanghai spirit' (equality, openness) under massive influence of China could easily be turned into a 'Beijing spirit" with strict hierarchy among SCO member states," said Daniyar Kosnazarov, head of the Central Asia and Caspian Region Department at the Analytical Complex of the Library of the First President of Kazakhstan, in an interview with The Bug Pit. "That is why Nazarbayev put an emphasis on Shanghai spirit again and again in his speech." There are, of course, also plusses to the addition of the South Asian countries. The possibility (albeit still unclear) of an SCO development bank raises the prospect of increased investment in Central Asia, and the addition of, in particular, India, means that therw would be a lot more potential money in the bank. "Elevation to the global level opens the door to the prospect of project financing mechanisms within the SCO," Adil Kaukenov, a Kazakhstani expert on China, told Russia Direct. "That is Astana’s primary hope for expansion — the injection of Chinese and Indian capital in the development of infrastructure and energy." Nevertheless, in the majority of regional commentary on the planned expansion, concern seemed to dominate. It's not clear how far Karimov could go in blocking India and Pakistan's accession, but that will certainly be something to watch for, in particular if he has the silent support of the other Central Asian states. It also will be interesting to see how India and Pakistan's participation will be reflected in the SCO's anti-Western, pro-authoritarian rhetoric, given that India is a democracy and Pakistan a close military ally of the United States. And the proposed expansion may not be over: Iran is likely the next potential member, and with a deal on its nuclear program now signed, that would seem to remove the major barrier to Tehran's accession. Interesting times ahead.